ARGENTINA, 1991: Impacts of liberalization policies on industrial restructuring. London School of Economics and UN ECLAC. ARGENTINA, BRAZIL, CHILE, SPAIN, 1993-94: Regional policies after adjustment programs and democratic transitions. CSIC Spain in coordination with UN ECLAC Argentina, CEDEPLAR Brazil and IEUR Chile. BANGLADESH, 2001-2003: Strengthening Labour Standards. Government of Bangladesh, ADB and ILO. BANGLADESH, 1997: Urban Poverty Reduction Project $24.5 million. Government of Bangladesh and ADB. BENIN, 2016-17: Strengthening Human Capital and Social Protection. Government of Benin and ILO. BOLIVIA, 2006: Support to Bolivia’s National Development Plan. Government of Bolivia and UN DESA. BOLIVIA, 2004: Joint Staff Training Program Poverty Reduction Strategy Papers (PRSPs). World Bank Institute and others. BOTSWANA: Universal Old-Age Pension. ILO, 2016. CHINA, 2000: Social Security Reform Program - Assessing the distributional impacts. Government of the People’s Republic of China, ADB and DFID. CONGO DR, 2017. Implementation of the National Social Protection Strategy. Gov't of DR Congo and ILO. COTE D’IVOIRE: Social Protection Strategy Policy Review. Gov’t of Ivory Coast and ILO, 2017. ECUADOR and UNASUR, 2008: The Bank of the South- Regional Consultation and Technical Workshop. Government of Ecuador and UN Department of Economic and Social Affairs. ECUADOR, 2007-2009: One-UN UNDAF to support Ecuador’s National Development Plan. Government of Ecuador, UNDP and UN organizations. EGYPT, 2012-15: Strengthening Social Protection after the Arab Spring. Ministry of Social Solidarity of Egypt, UNICEF, ILO. EL SALVADOR, 2014: Support to Pension Reform and Universal Social Protection. Gov't of El Salvador, ILO. ETHIOPIA, 2015: Support to Ethiopia’s National Social Protection Policy. Government of Ethiopia and ILO. INDIA, 1997: Low Income Housing Project $300 million. Government of India and ADB. INDONESIA, 1998-2001: Strategies for Improved Social Protection. Government of Indonesia and ADB. INDONESIA, 1998: Country Poverty Assessment and Strategy in support of the Seventh Five-Year Development Plan RAPELITA VII. Government of Indonesia and ADB. INDONESIA, 1996: Family Health and Nutrition Project $45 million. Government of Indonesia and ADB. JAPAN, 2001: Capacity Building on Social Safety Nets. ADB Institute Tokyo. KAZAKHSTAN, 1998: Social Service Delivery and Finance Project. Government of Kazakhstan and ADB. KAZAKHSTAN and KYRGYZTAN, 1995-96: Support to Country Strategies. Government of Kazakhstan and Kyrgyz Republic and ADB. KENYA, 2012: Social Intelligence Report. Government of Kenya and UNICEF. Kyrgyz Republic, World Bank, ADB and IMF. KYRGYZTAN, 1998: Social Service Delivery and Finance $10 million Investment Project. Government of the Kyrgyz Republic, ADB and OPEC Fund. LAO PDR, 1996-97: Urban Sector Strategy. Government of Lao PDR and ADB. and Social Commission West Asia (ESCWA). MALAYSIA, 2001: Capacity Building on Social Safety Nets. Gov’t of Malaysia, ASEAN and ADB. MALAWI. 2016. Social Support Program. ILO. 2016. MEXICO, 2008: High Level Dialogue on the expansion of Social Protection Programs. Government of Mexico, EU and development partners. MONGOLIA, 2005: Training on Poverty Reduction and Development, with Nobel Laureate J. Stiglitz. Soros Foundation and Initiative for Policy Dialogue. 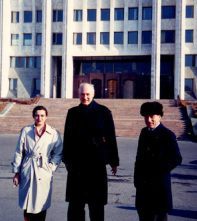 MONGOLIA, 1998: Support to Country Strategy. Government of Mongolia and ADB. MOZAMBIQUE: One-UN Social Protection Floor. UNICEF and ILO, 2012-2015. NEPAL, 2007: Support to Nepal’s Interim Development Plan. Government of Nepal, UN DESA with UNICEF. NEPAL, 2001-03: Strengthening Labour Standards. Government of Nepal, ADB and ILO. NICARAGUA, 2004: Harmonization and Aid Alignment - OECD-DAC Partner Countries Meeting. Governments of Bangladesh, Bolivia, Cambodia, Ethiopia, Fiji, Kyrgyztan, Morocco, Mozambique, Nicaragua, Niger, Senegal, Tanzania, Viet Nam and Zambia, OECD-DAC and UNDP. NIGERIA, 2017. Operationalization of the National Social Protection Policy. Gov’t of Nigeria and ILO. PALESTINE OCUPPIED TERRITORY, 2014: Extending Social Protection. Palestinian Authority and ILO. PARAGUAY-BOLIVIA, 2009: Forced Labour and Servitude of Indigenous Guarani population. Government of Paraguay and Bolivia, UN DESA, ILO, FAO and others. PHILIPPINES, 2001-2003: Strengthening Labour Standards. Government of Philippines, ADB and ILO. PHILIPPINES, 1996: Second Basic Education Project. Government of Philippines and ADB. SENEGAL, 2009: Training on Socio-Economic Policies for Children. UNICEF. SOUTH AFRICA, 2007-2006: SADC Ministerial High Level Dialogue Towards an African Regional Social Policy. Government of South Africa and UN DESA. SOUTH KOREA, 2014: Economic and Social Councils, Social Dialogue and Social Protection. Government of South Korea, ILO and AICESIS. SRI LANKA, 1998-2001: Strategies for Improved Social Protection. Government of Sri Lanka and ADB. TAJIKISTAN, 1999: Post Conflict Social Sector Rehabilitation $20 million Investment Project. Government of Tajikistan, ADB and UNDP/UNOPS. TAJIKISTAN, 1998: Support to Country Strategy. Government of Tajikistan and ADB. TANZANIA, 2016: National Social Protection Policy and Zanzibar Universal Pension Scheme. ILO, Gov'ts of Tanzania and Zanzibar. THAILAND, 1998-2001: Strategies for Improved Social Protection. Government of Thailand and ADB. TUNISIA, 2014-2015: A Social Protection Floor for a New Social Contract. ILO, 2014-2016. UGANDA, 2012: Real-time Monitoring of the Most Vulnerable. UNICEF. UZBEKISTAN, 1995: ADB Main Economic Report on Uzbekistan. Gov’t of Uzbekistan and ADB. VENEZUELA, 2008: Regional Integration, Bank of the South and Bank of ALBA. SELA and UNDESA. VIETNAM, 1998-2001: Strategies for Improved Social Protection. Government of Vietnam and ADB. ZAMBIA, 2004: Rural Transport Investment Project €10 million. Government of Zambia and KfW.